Senior guard Sha Brooks scored a team-high 17 points and No. 12/16 Florida held off a stingy Kentucky team for a 74-59 victory on Thursday in the Stephen C. O’Connell Center. The Gators (19-2, 5-1 Southeastern Conference), who wrapped up their three-game homestand with their 13th consecutive home win, led by as many as 18 points in the game before the Wildcats (12-9, 2-4 SEC) trimmed their deficit down to five points, 55-50, with 8:45 remaining and then were within nine points, 65-56, with 3:31 on the clock. Freshman guard Trumae Lucas drained a deep basket from the left wing with 2:31 left and senior center Aneika Henry posted a key block at the other end to give the Gators a 67-56 lead that they would not relinquish. 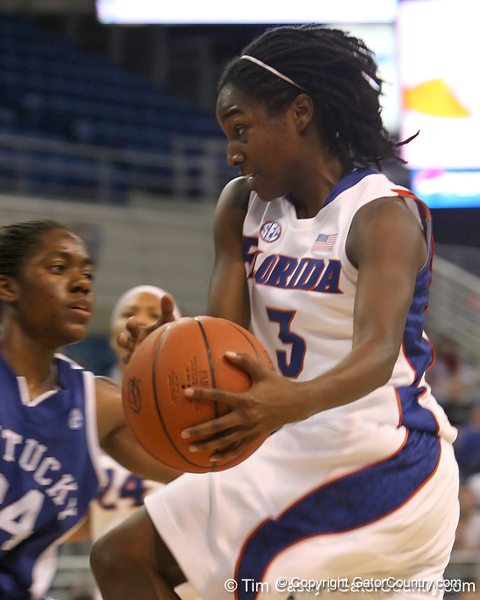 Florida won the rebound battle 42-36 and scored 25 points off of 23 Kentucky turnovers. The Gators shot 46.7 percent (28-of-60) from the floor for the game, while limiting the Wildcats to 31.6 percent (18-of-57) shooting from the floor. Brooks, who also tied her career high with nine assists and also added a season-high six steals, was one of four Florida players in double-figure point totals. Lucas scored a career-high 14 points in a career-high 29 minutes of action, while senior forward Marshae Dotson chipped in 13 points and a squad-best eight boards. Junior forward Sharielle Smith added 10 points, including a perfect 6-for-6 from the free-throw line. Her six made free throws tied a career high. Junior guard Steffi Sorensen finished with nine points, including three 3-pointers, with nine rebounds. She extended her streak of consecutive games with a 3-pointer to 16, the fifth-longest streak in program history. Florida returns to action on Sunday when it travels to Fayetteville, Ark., to take on Arkansas in what will be the 1,000th game in program history. Tip-off is slated for 3 p.m.
Florida senior guard Sha Brooks passes under the basket during the second half of the Gators' 74-59 win against the Kentucky Wildcats on Thursday, January 29, 2009 at the Stephen C. O'Connell Center in Gainesville, Fla.